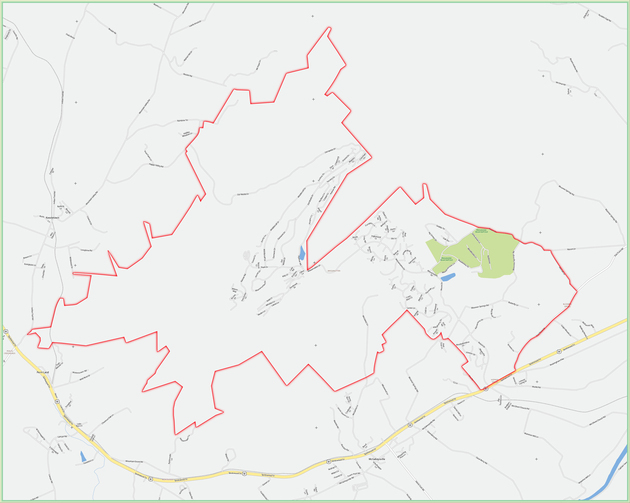 Massanutten Village consists of roughly twenty-six (26) miles (fifty-two  lane miles) of roads which are privately owned and maintained by MPOA. These roads could be legally transferred (by the MPOA Board of Directors) to an incorporated town of Massanutten for maintenance. Massanutten Village (West) has an additional road, Del Webb Drive from the Massanutten Mountain Overlook to Happy Valley Road, which is privately owned by Great Eastern Resorts (GER) and not regularly maintained having fallen into a state such that it requires major improvements before it could support regular use. It is not likely that this road would be transferred to an incorporated town of Massanutten for maintenance until it undergoes necessary improvements. There are roughly twelve (12) lane miles of roads in the Woodstone Meadows, Village Festival and Massanutten Station areas which are currently owned and maintained by VA Department of Transportation (VDOT). This lane mileage includes Route 644 (Resort Drive) plus the hard surfaced parts of Route 646 (Bloomer Springs Road) and Route 645 (Michael Lane) as well as roads in the Woodstone Meadows Property Owners Association. All of these roads could be legally transferred to an incorporated town of Massanutten for maintenance. However, it should be noted that there are many portions of Woodstone Meadows, Village Festival and Massanutten Station which are currently under or will be under development and the associated roads would not be transferred to an incorporated town of Massanutten for maintenance until the development projects are completed. Therefore, an incorporated town of Massanutten could have from the outset a total of roughly sixty-four (64) lane miles in a system of town maintained roads. A map of all roads in an incorporated town of Massanutten is shown below. It was determined that town streets and collectors would likely require resurfacing every 20 years, Route 644 (Resort Drive) from Route 33 to the Woodstone Meadows Driving Range would likely require resurfacing every 10 years, and Massanutten Drive would likely require resurfacing every 5 years, unless such time it is widened to accommodate the heavier traffic load. Given this resurfacing schedule and the current cost of asphalt, the cost of resurfacing all town roads every 20 years would be roughly $4.5 million or an annualized cost of roughly $300,000. It is important to note that one way for an incorporated town to regularly conduct resurfacing of its roads can be to acquire municipal bonds repaid at this annualized rate. It should be also noted that if MPOA legally transferred its roads to an incorporated town of Massanutten for maintenance, it would no longer have a need for all of its road maintenance assets. MPOA could donate these maintenance assets to the incorporated town providing the town a good point of departure immediately after incorporation to continue providing MPOA property owners, all of whom would be within the incorporated town limits, with the outstanding road maintenance they have enjoyed over the last thirty-five (35) years.